The war has been brought to a glorious end, but the need for food has increased instead of decreased. We must send food not only to our Allies but also to millions of other war stricken people. 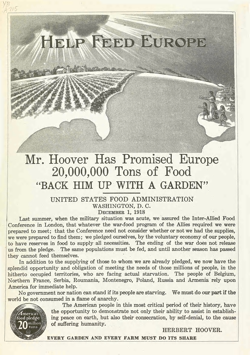 As this page goes to press, Mr. Hoover is in Europe getting first hand information and making plans to help these starving millions. When he comes back he will no doubt tell us that the need is much greater than anyone had realized. Every one of us must do our part — not only in saving food, but, what is of greater importance, in producing it. Every farm should be worked to the limit and every garden should be made to produce to the utmost. Plant vegetables that will save meat, transportation and wheat. Gardening, which cuts your grocery bills in half, gives you healthful exercise during the long twilight evenings, and provides fresh vegetables for your table during the summer and a generous supply for winter storage, is surely a pleasant and easy way of aiding the war stricken people of Europe. Plant every acre and every foot of ground but above all plant only seed that you know to be of high quality. To risk your labor and your land to seeds of unknown quality is the worst kind of folly. You may save a few cents in the cost of the seed, but on the other hand you may not only lose your crops, but also introduce on your farm a host of vicious weeds. 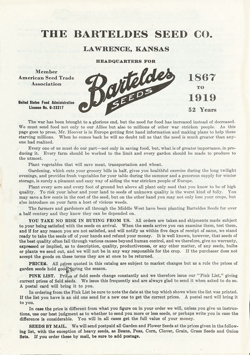 The farmers and gardeners all through the Middle West have been planting Barteldes Seeds for over a half century and they know they can be depended on. 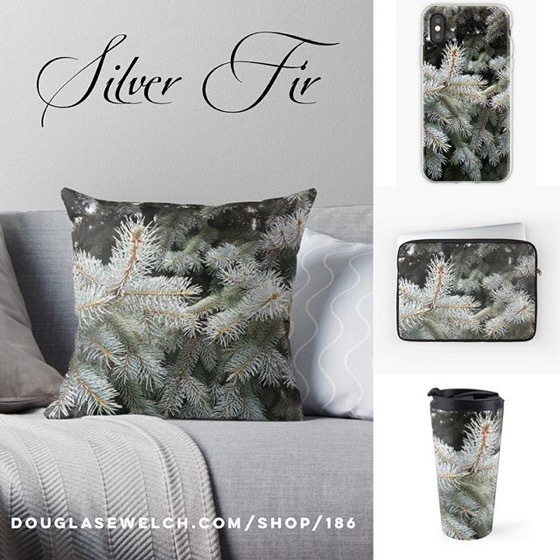 YOU TAKE NO RISK IN BUYING FROM US. All orders are taken and shipments made subject to your being satisfied with the seeds on arrival. When the seeds arrive you can examine them, test them, and if for any reason you are not satisfied, and will notify us within five days of receipt of same, we stand ready to take the seeds off of your hands and refund your money. 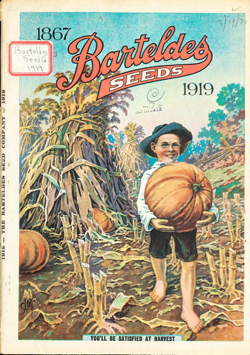 It is well known, however, that seeds of the best quality often fail through various causes beyond human control, and we therefore, give no warranty, expressed or implied, as to description, quality, productiveness, or any other matter, of any seeds, bulbs or plants we send out, and we will not be in any way responsible for the crop. If the purchaser does not accept the goods on these terms they are at once to be returned. PRICES. 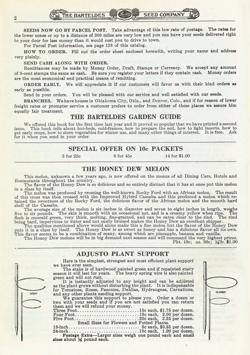 All ptices quoted in this catalog are subject to market changes but as a rule the prices of garden seeds hold goot^uring the season. PINK LIST. Prices of field seeds change constantly and we therefore issue our “Pink List,” giving current prices of field seeds. We issue this frequently and are always glad to send it when asked to do so. A postal card will bring it to you. In ordering from the Pink List be sure to note the date at the top which shows when the list was printed. If the list you have is an old one send for a new one to get the correct prices. A postal card will bring it to you. In case the price is different from what you figure on in your order we will, unless you give us instructions, use our best judgment as to whether to send you more or less seeds, or perhaps write you in case the difference is considerable. You will in all cases get the full value of your money. SEEDS BY MAIL. We will send postpaid all Garden and Flower Seeds at the prices given in the following list, with the exception of heavy seeds, as Beans, Peas, Corn, Clover, Grain, Grass Seeds and Onion Sets. 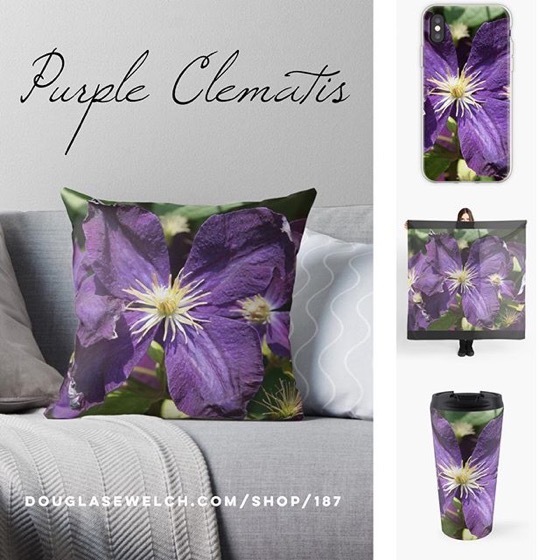 If you order these by mail, be sure to add postage.